I intentionally took photos of the foods I take for the sake of the spouse. At some point of my pregnancy, I've lost interest on foods but as far as I don't care about the amount of foods I have to take, I always feel it is wise to take at least a small portion of food for the baby to absorb nutrients from. Although I personally think that I've been munching more on unhealthy foods this final trimester. 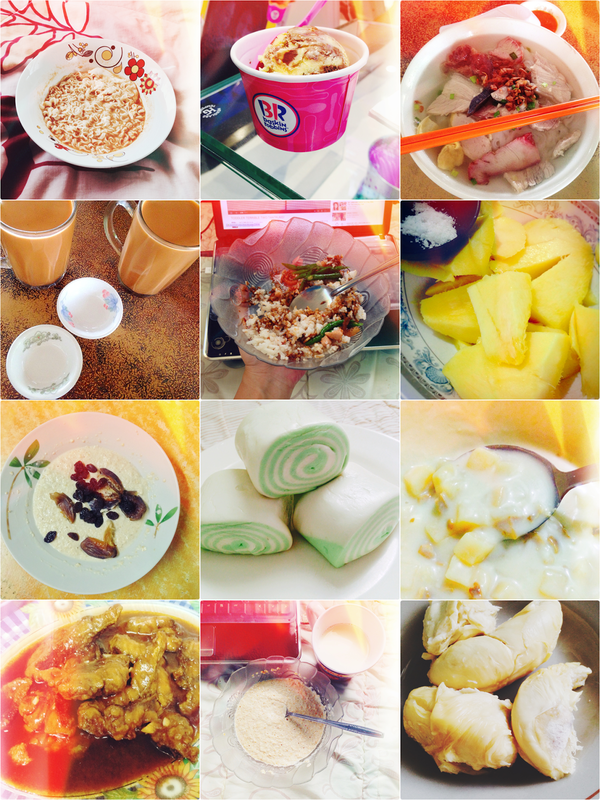 Some of this food pic are proofs that I have been taking something into my system. 1. Curry Flavored Instant Noodles with egg. 6. Bambangan (Mangifera pajang), a mango variety unique to Borneo. 7. Captain Oat with milk, raisins and dates. 8. Mantao, chinese steam bun/bread. 9. Campbell's Soup. I forgot the name but it has chunks of chicken and potato in it. 10. Dad's sweet and sour fish. 11. Captain Oat with milk. I basically take the same thing every single day. Although there's no picture proof of it, I must admit that I am a fan of noodles throughout my pregnancy. It must have be hard for the spouse to cope with my cravings for noodles. Noodles, all day everyday!